For many products, it is easy to identify something that is worn. But understanding how it got to that state is not as simple! ASTM International defines wear as "damage to a solid surface (generally involving progressive loss of material), caused by the relative motion between that surface and a contacting substance or substances". In most instances, the material removal is a gradual process and the motion is a repetitive action. Two common types of wear that occur are wear abrasion and mar abrasion. Wear abrasion is the removal of a portion of the surface by some kind of mechanical action (e.g. rubbing or sliding back and forth of an object). 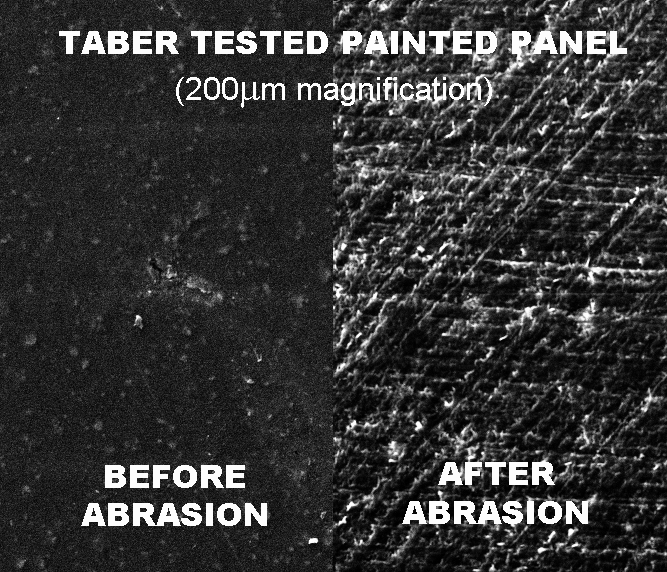 Mar abrasion is the permanent deformation of a surface but the deformation does not break the surface. Do not confuse wear with abrasion. Although the terms are frequently used interchangeably, wear is "the wearing away of any part of a material by rubbing against another surface" and abrasion is the action that causes it. Attempting to recreate wear damage in a laboratory setting involves determining a complex combination of interrelated properties. Wear is a response resulting from the conditions to which the whole system is exposed. Resistance to abrasion is affected by the nature of abradant, variable action of the abradant over the area of specimen being abraded, tension of the specimen, the pressure between the specimen and abradant, the dimensional changes in the specimen, sliding speed, material composition and hardness, and environmental conditions. The objective of most laboratory tests are to provide predictive performance under a specified set of criteria and correlate with end-use performance. Yet when you evaluate the conditions a product is exposed to during its life, one quickly realizes the task of developing wear test methodology is both multifaceted and difficult. None-the-less, laboratory wear tests have the potential to provide considerable insight into the various factors that contribute to a material's performance. A controlled laboratory test allows the user to approximate field conditions and eliminate extraneous variables. This enables the life span of a product to be compressed into a much shorter duration, and allows materials to be evaluated in the same manner within a controlled environment. 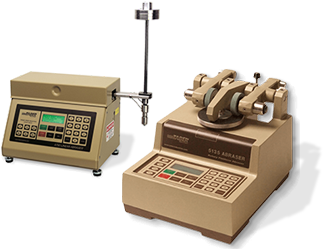 While most standardized test methods specify the parameters that must be adhered to when conducting tests, you should accept the fact that you will probably not be able to accurately identify all of the influences that create wear conditions. It is imperative that you understand the limitations of your testing because accelerated wear testing may not always identify potential problems or predict field performance results.